Last week, I mentioned to my friend that I didn’t know when to start when planning how to update Syd’s bedroom,. The following day, she sent over the following information on updating a child’s bedroom. I loved it so much, I wanted to share…. Lighting can sometimes be the last thing that we consider when updating a child’s bedroom, but it can make an enormous difference. Kids’ bedroom lighting should be fun but functional, and there are plenty of designs on the market to suit kids of all ages. When using lighting to decorate a room, you should incorporate the rule of three and choose three fixtures at different levels. Generally, a good way to go is to combine a pendant light on the ceiling with a table lamp and a floor lamp. Lighting should be bright enough for your child to do tasks in their room, like homework,… But also controllable so that they can relax in their bedroom. Spotlights are ideal for children’s bedrooms as they can be used for different zones. Their focused light is also great for reading in bed. You can buy spotlights which attach to the headboard or wall behind the bed specifically for that purpose. If you’re looking to make your child’s bedroom lighting last as they grow, opting for LED lighting is best. LED bulbs have a lifespan of around 30,000 hours, with some even lasting up to 50,000 hours. LEDs can also help you save money on your electricity bulbs, as they use less energy. In a kid’s bedroom, safety is a top priority and LEDs are the safest option for lighting as they are less likely to shatter and they are not hot to the touch. LEDs may seem more expensive initially, but you will recoup the costs back from your energy bills. If your child’s room is based on a theme, extend this to the lighting! For instance, if your little one loves pirates, look for porthole type lights. Or, if your child wants to create a mystical fairy den in their room… Use string lights wrapped around their bed for a whimsical effect. Make the Most of Natural Light when updating a child’s bedroom. No artificial lighting ever matches natural light, so make the most of it! Keep the window dressings minimal, use fresh colours such as blue and use lots of white. You can top up the natural light with artificial light. Cool white LED light is the best for this. The key to flexible lighting in any room in the home is making sure that they are dimmable. If you are swapping from incandescent to LED lights, you will not be able to use the same dimmer switch. You will find that the incompatibility makes your LEDs flicker, buzz and hum. It is possible to make any light dimmable, from spotlights to table lamps. You should always use a professional electrician for any wiring work, though. Dimmable lights can work well as a grown-up alternative to a night light. Definitely worth considering when updating a child’s bedroom. Safety is a priority in a child’s bedroom, especially with lighting. Make sure any cables are covered and attached to the wall safely. Light switches should work properly too. Your child’s bedroom is the best room of the home to have fun with lighting! 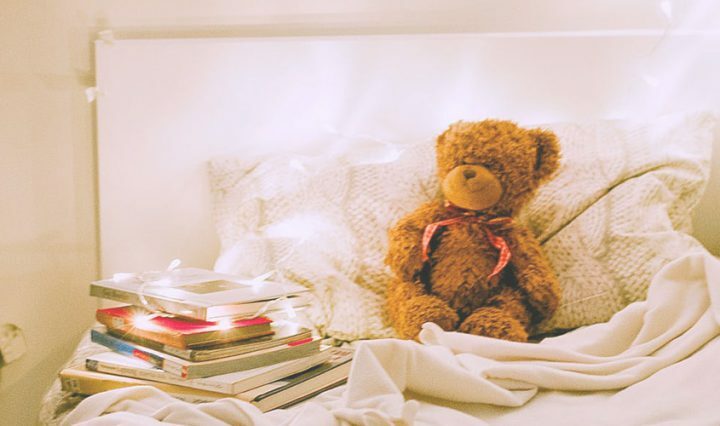 Incorporate their favourite characters, dangle fairy lights everywhere and make sure that their bedroom is place that they enjoy spending time in. If you don’t want to be regularly changing your child’s bedroom lighting, look for fixtures that will grow up with them. For instance, a simple colourful pendant light above the bed will be timeless. What lighting do you use in your child’s bedroom? Finally, if you enjoyed this post, why not check out my interiors category?